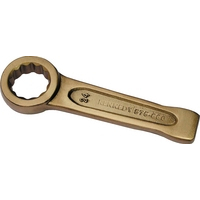 The Non Sparking Tools offered by us are generally chosen in industries and also used for domestic purposes. 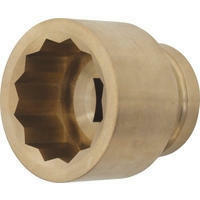 We are engaged in manufacturing a wide range of these non sparkling tools to all our customers. Our range is in huge demand due to its attractive finish and greater mechanical properties. 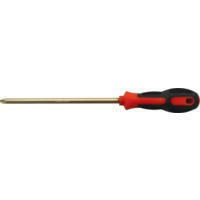 The perfect range of non sparking tools is available with lifetime guarantee. 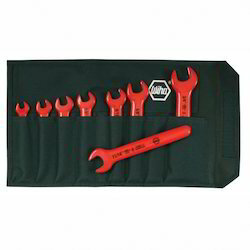 These non magnetic and corrosion resistant tools softer put on down easily and fast as compared to other conventional tools that reduce the risk of a sparks. We provide 12 point bi-hexagon. 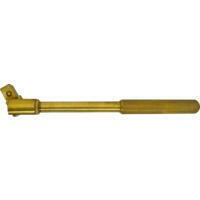 We offer a quality range of theseSingleOpenEndedSpannersthat fulfills the varied requirements of the industry. Our range of products is widely appreciated by various customers due to its anti abrasive finish, sturdy construction and firm grip. We supply these products by using quality material and with various specifications and also these are available at market leading prices. 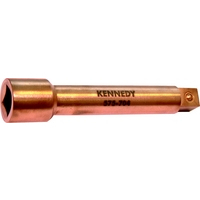 This is non sparking tool used by plumbers, electricians and automobile engineers in different assembly, jointing and repair works. 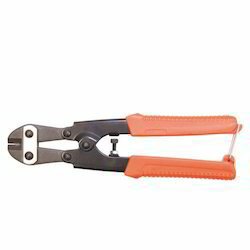 We provide 8" straight edge Mini Bolt Clipper which are bolt cutters with compound action magnifies the pressure applied to the handle. Ensures a concentration of force between the jaws. We Offer Short Arm Combination Spanners manufactured from quality chrome vanadium steel with hardened jaws and high polish mirror finish, corrosion resistant and easy to clean. The jaws and ring are off set at 15 degrees for easier location and application of torque to the fastener. Suitable for use in areas of very restricted access. 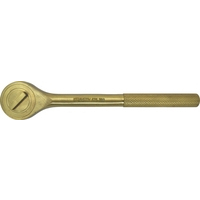 Professional Flex-Head Ratchets are made from chrome vanadium steel with mirror polish finish, preventing oil and dirt from adhering to the spanner, making for easier cleaning and preventing rust. 72-teeth ratcheting system which needs only 5° movement to operate ratchet. Thin wall design for greater access. Head flexes up to 90° in either direction. Conform to asme b107. 6. 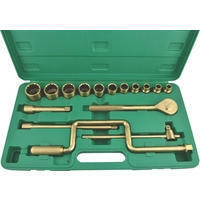 Flex head ratchet combination spanners: 10, 11, 12, 13, 14,15, 16, 17 and 19mm. Quick release square drive adaptors -1/4" sd (x10mm hex); 3/8" sd (x13mm hex); 1/2" sd (x19mm hex). Supplied in a heavy duty fitted storage case. We offer a hue gamut of AdjustableWrenches, which have adjustable jaws widths for binding different kinds of nuts and other components. These are made of high quality raw materials that are procured from our well known vendors of the industry. 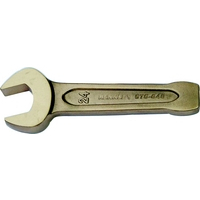 Our ranges of adjustable wrenches are appreciated for their good grip, high tensile strength, durability and hassle free operation. These are mostly used in a wide range of industrial and domestic applications. Manufactured from chrome vanadium steel. 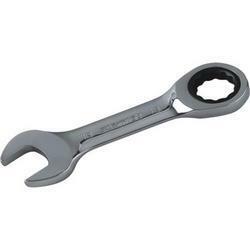 Spanner dimensions conform to DIN 7447. Fully insulated to conform to VDE 0680/201, IEC 900 & BS EN 60900 standards for safe electrical applications up to 1000V. Chrome vanadium single ended open jaw spanners. 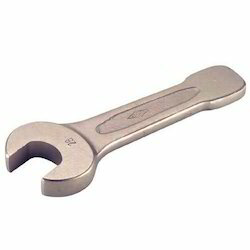 Spanner dimensions conform to DIN 7446. Fully insulated to conform to VDE 0680/201, IEC 900 and BS EN 60900 standards for safe electrical applications up to 1000V. Manufactured from chrome vanadium steel with a satin finish body and highly polished heads. 15 open jaw angle to shank and ring end offset. 5.5mm - 25mm, 1/4" - 1" AF - DIN 3113. 26mm - 95mm, 11/16" - 2" AF - ASME B107.6. 1/8" - 1/2" Whitworth - DIN 3113 & BS192:1982. 9/16" - 7/8" Whitworth - ASME B107.6 & BS192:1982. 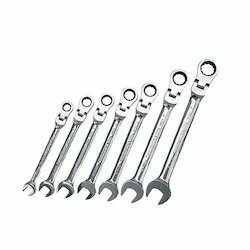 Each Kennedy combination spanner in this 18 piece set is manufactured from industrial quality chrome vanadium steel with a corrosion resistant satin finish body and polished head. The open jaws are cranked at 15 and the Bi-hexagonal drive ring drive end is offset, to improve contact and make positioning the spanner on the fastener being tightened or loosened easier. 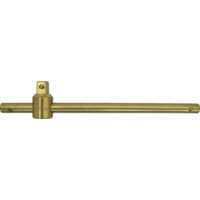 Chisel Cross 4-point spark resistant chisel with 20mm wide hexagon shaft. Length: 200mm. Spark-resistant tools are used to eliminate the chances of accidental fires or explosions in potentially combustible or explosive environments. They resist the sparks that a standard tool could potentially create when striking hard surfaces. The use of spark resistant tools is essential in many industrial applications such as petroleum and chemical manufacturing, spray booth operations, the marine industry, the mining industry, the paper industries, or any location where flammable vapours or combustible residues are present. Aluminium-bronze spark resistant safety tools are manufactured to 25HRC and offer a breaking strain of 75 - 85kgf/mm2. Spark-resistant tools must be maintained with special care. Frequent cleaning/re-dressing to remove ferrous particles or contaminants, which may impair the spark-resistant properties, is essential. Flat Cold Chisels Spark-resistant tools are used to eliminate the chances of accidental fires or explosions in potentially combustible or explosive environments. They resist the sparks that a standard tool could potentially create when striking hard surfaces. The use of spark resistant tools is essential in many industrial applications such as petroleum and chemical manufacturing, spray booth operations, the marine industry, the mining industry, the paper industries, or any location where flammable vapours or combustible residues are present. Aluminium-bronze spark resistant safety tools are manufactured to 25HRC and offer a breaking strain of 75 - 85kgf/mm2. Spark-resistant tools must be maintained with special care. Frequent cleaning/re-dressing to remove ferrous particles or contaminants, which may impair the spark-resistant properties, is essential. Crosspoint Spark-resistant tools are used to eliminate the chances of accidental fires or explosions in potentially combustible or explosive environments. They resist the sparks that a standard tool could potentially create when striking hard surfaces. The use of spark resistant tools is essential in many industrial applications such as petroleum and chemical manufacturing, spray booth operations, the marine industry, the mining industry, the paper industries, or any location where flammable vapours or combustible residues are present. Aluminium-bronze spark-resistant safety tools are manufactured to 25HRC and offer a breaking strain of 75 - 85kgf/mm2. Spark-resistant tools must be maintained with special care. Frequent cleaning/re-dressing to remove ferrous particles or contaminants, which may impair the spark resistant properties, is essential. 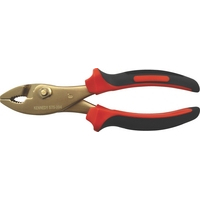 Long Nose Pliers With side cutter, serrated jaws and safety grips. Spark-resistant tools are used to eliminate the chances of accidental fires or explosions in potentially combustible or explosive environments. They resist the sparks that a standard tool could potentially create when striking hard surfaces. The use of spark resistant tools is essential in many industrial applications such as petroleum and chemical manufacturing, spray booth operations, the marine industry, the mining industry, the paper industries, or any location where flammable vapours or combustible residues are present. Aluminium-bronze spark resistant safety tools are manufactured to 25HRC and offer a breaking strain of 75 - 85kgf/mm2. Spark-resistant tools must be maintained with special care. Frequent cleaning/re-dressing to remove ferrous particles or contaminants, which may impair the spark-resistant properties, is essential. 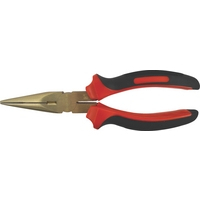 Adjustable Combination Pliers Serrated teeth with sliding pivot joint. Overall length: 203mm (8”). Spark-resistant tools are used to eliminate the chances of accidental fires or explosions in potentially combustible or explosive environments. They resist the sparks that a standard tool could potentially create when striking hard surfaces. The use of spark resistant tools is essential in many industrial applications such as petroleum and chemical manufacturing, spray booth operations, the marine industry, the mining industry, the paper industries, or any location where flammable vapours or combustible residues are present. Aluminium-bronze spark resistant safety tools are manufactured to 25HRC and offer a breaking strain of 75 - 85kgf/mm2. Spark-resistant tools must be maintained with special care. Frequent cleaning/re-dressing to remove ferrous particles or contaminants, which may impair the spark-resistant properties, is essential. 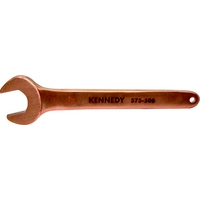 Open End Slogging Wrench With flat striking faces to allow hammer blows to be used to loosen or tighten stubborn fasteners. Spark-resistant tools are used to eliminate the chances of accidental fires or explosions in potentially combustible or explosive environments. They resist the sparks that a standard tool could potentially create when striking hard surfaces. The use of spark resistant tools is essential in many industrial applications such as petroleum and chemical manufacturing, spray booth operations, the marine industry, the mining industry, the paper industries, or any location where flammable vapours or combustible residues are present. Aluminium-bronze spark resistant safety tools are manufactured to 25HRC and offer a breaking strain of 75 - 85kgf/mm2. Spark-resistant tools must be maintained with special care. Frequent cleaning/re-dressing to remove ferrous particles or contaminants, which may impair the spark-resistant properties, is essential. Single Open End Spanners Spark-resistant tools are used to eliminate the chances of accidental fires or explosions in potentially combustible or explosive environments. They resist the sparks that a standard tool could potentially create when striking hard surfaces. The use of spark resistant tools is essential in many industrial applications such as petroleum and chemical manufacturing, spray booth operations, the marine industry, the mining industry, the paper industries, or any location where flammable vapours or combustible residues are present. Aluminium-bronze spark resistant safety tools are manufactured to 25HRC and offer a breaking strain of 75 - 85kgf/mm2. Spark-resistant tools must be maintained with special care. Frequent cleaning/re-dressing to remove ferrous particles or contaminants, which may impair the spark-resistant properties, is essential. 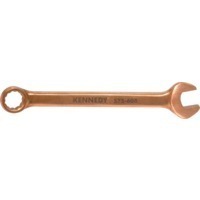 Ring End Slogging Wrench With flat striking faces to allow hammer blows to be used to loosen or tighten stubborn fasteners. Spark-resistant tools are used to eliminate the chances of accidental fires or explosions in potentially combustible or explosive environments. They resist the sparks that a standard tool could potentially create when striking hard surfaces. The use of spark resistant tools is essential in many industrial applications such as petroleum and chemical manufacturing, spray booth operations, the marine industry, the mining industry, the paper industries, or any location where flammable vapours or combustible residues are present. Aluminium-bronze spark resistant safety tools are manufactured to 25HRC and offer a breaking strain of 75 - 85kgf/mm2. Spark-resistant tools must be maintained with special care. Frequent cleaning/re-dressing to remove ferrous particles or contaminants, which may impair the spark-resistant properties, is essential. Combination Spanners Spark-resistant tools are used to eliminate the chances of accidental fires or explosions in potentially combustible or explosive environments. They resist the sparks that a standard tool could potentially create when striking hard surfaces. The use of spark resistant tools is essential in many industrial applications such as petroleum and chemical manufacturing, spray booth operations, the marine industry, the mining industry, the paper industries, or any location where flammable vapours or combustible residues are present. Aluminium-bronze spark resistant safety tools are manufactured to 25HRC and offer a breaking strain of 75 - 85kgf/mm2. Spark-resistant tools must be maintained with special care. Frequent cleaning/re-dressing to remove ferrous particles or contaminants, which may impair the spark-resistant properties, is essential. 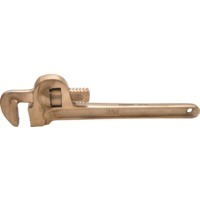 Pipe Wrenches Heavy Duty. 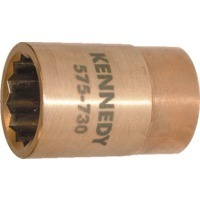 Serrated jaws with knurled adjusting nut. Spark-resistant tools are used to eliminate the chances of accidental fires or explosions in potentially combustible or explosive environments. They resist the sparks that a standard tool could potentially create when striking hard surfaces. The use of spark resistant tools is essential in many industrial applications such as petroleum and chemical manufacturing, spray booth operations, the marine industry, the mining industry, the paper industries, or any location where flammable vapours or combustible residues are present. Aluminium-bronze spark resistant safety tools are manufactured to 25HRC and offer a breaking strain of 75 - 85kgf/mm2. Spark-resistant tools must be maintained with special care. Frequent cleaning/re-dressing to remove ferrous particles or contaminants, which may impair the spark-resistant properties, is essential. Adjustable Wrenches Smooth jaw adjustment with self-locking design which prevents the jaws opening unintentionally under load. Spark-resistant tools are used to eliminate the chances of accidental fires or explosions in potentially combustible or explosive environments. They resist the sparks that a standard tool could potentially create when striking hard surfaces. The use of spark resistant tools is essential in many industrial applications such as petroleum and chemical manufacturing, spray booth operations, the marine industry, the mining industry, the paper industries, or any location where flammable vapours or combustible residues are present. Aluminium-bronze spark resistant safety tools are manufactured to 25HRC and offer a breaking strain of 75 - 85kgf/mm2. Spark-resistant tools must be maintained with special care. Frequent cleaning/re-dressing to remove ferrous particles or contaminants, which may impair the spark-resistant properties, is essential. Sliding T-Handles The sliding bar gives many options for leverage within a given space. Fitted with a spring-loaded ball bearing socket retainer. Spark-resistant tools are used to eliminate the chances of accidental fires or explosions in potentially combustible or explosive environments. They resist the sparks that a standard tool could potentially create when striking hard surfaces. The use of spark resistant tools is essential in many industrial applications such as petroleum and chemical manufacturing, spray booth operations, the marine industry, the mining industry, the paper industries, or any location where flammable vapours or combustible residues are present. Aluminium-bronze spark resistant safety tools are manufactured to 25HRC and offer a breaking strain of 75 - 85kgf/mm2. Spark-resistant tools must be maintained with special care. Frequent cleaning/re-dressing to remove ferrous particles or contaminants, which may impair the spark-resistant properties, is essential. 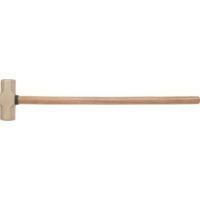 Sledge Hammers Spark-resistant sledge hammers with wooden handles. Spark-resistant tools are used to eliminate the chances of accidental fires or explosions in potentially combustible or explosive environments. They resist the sparks that a standard tool could potentially create when striking hard surfaces. The use of spark resistant tools is essential in many industrial applications such as petroleum and chemical manufacturing, spray booth operations, the marine industry, the mining industry, the paper industries, or any location where flammable vapours or combustible residues are present. Aluminium-bronze spark resistant safety tools are manufactured to 25HRC and offer a breaking strain of 75 - 85kgf/mm2. Spark-resistant tools must be maintained with special care. Frequent cleaning/re-dressing to remove ferrous particles or contaminants, which may impair the spark-resistant properties, is essential. 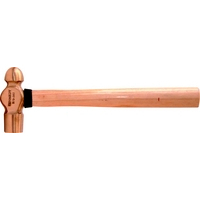 Ball Pein Hammers For use with cold chisels, punches, rivets and for shaping metal. Fine grain hardwood shaft. Spark-resistant tools are used to eliminate the chances of accidental fires or explosions in potentially combustible or explosive environments. They resist the sparks that a standard tool could potentially create when striking hard surfaces. The use of spark resistant tools is essential in many industrial applications such as petroleum and chemical manufacturing, spray booth operations, the marine industry, the mining industry, the paper industries, or any location where flammable vapours or combustible residues are present. Aluminium-bronze spark resistant safety tools are manufactured to 25HRC and offer a breaking strain of 75 - 85kgf/mm2. Spark-resistant tools must be maintained with special care. Frequent cleaning/re-dressing to remove ferrous particles or contaminants, which may impair the spark-resistant properties, is essential. Ratchet Handle Disc type adjustment with knurled grip and spring loaded ball bearing socket retainer. Spark-resistant tools are used to eliminate the chances of accidental fires or explosions in potentially combustible or explosive environments. They resist the sparks that a standard tool could potentially create when striking hard surfaces. The use of spark resistant tools is essential in many industrial applications such as petroleum and chemical manufacturing, spray booth operations, the marine industry, the mining industry, the paper industries, or any location where flammable vapours or combustible residues are present. Aluminium-bronze spark resistant safety tools are manufactured to 25HRC and offer a breaking strain of 75 - 85kgf/mm2. Spark-resistant tools must be maintained with special care. Frequent cleaning/re-dressing to remove ferrous particles or contaminants, which may impair the spark-resistant properties, is essential. 1/2” Square Drive Swivel Handle The hinged link allows operation at varied angles to aid access in restricted areas. Fitted with a spring loaded ball bearing socket retainer. Spark-resistant tools are used to eliminate the chances of accidental fires or explosions in potentially combustible or explosive environments. They resist the sparks that a standard tool could potentially create when striking hard surfaces. The use of spark resistant tools is essential in many industrial applications such as petroleum and chemical manufacturing, spray booth operations, the marine industry, the mining industry, the paper industries, or any location where flammable vapours or combustible residues are present. Aluminium-bronze spark resistant safety tools are manufactured to 25HRC and offer a breaking strain of 75 - 85kgf/mm2. Spark-resistant tools must be maintained with special care. Frequent cleaning/re-dressing to remove ferrous particles or contaminants, which may impair the spark-resistant properties, is essential. Safety Extensions Fitted with a spring-loaded ball bearing socket retainer. Spark-resistant tools are used to eliminate the chances of accidental fires or explosions in potentially combustible or explosive environments. They resist the sparks that a standard tool could potentially create when striking hard surfaces. The use of spark resistant tools is essential in many industrial applications such as petroleum and chemical manufacturing, spray booth operations, the marine industry, the mining industry, the paper industries, or any location where flammable vapours or combustible residues are present. Aluminium-bronze spark resistant safety tools are manufactured to 25HRC and offer a breaking strain of 75 - 85kgf/mm2. Spark-resistant tools must be maintained with special care. Frequent cleaning/re-dressing to remove ferrous particles or contaminants, which may impair the spark-resistant properties, is essential. Sockets 12 point bi-hexagon. Spark-resistant tools are used to eliminate the chances of accidental fires or explosions in potentially combustible or explosive environments. They resist the sparks that a standard tool could potentially create when striking hard surfaces. The use of spark resistant tools is essential in many industrial applications such as petroleum and chemical manufacturing, spray booth operations, the marine industry, the mining industry, the paper industries, or any location where flammable vapours or combustible residues are present. Aluminium-bronze spark resistant safety tools are manufactured to 25HRC and offer a breaking strain of 75 - 85kgf/mm2. Spark-resistant tools must be maintained with special care. Frequent cleaning/re-dressing to remove ferrous particles or contaminants, which may impair the spark-resistant properties, is essential. 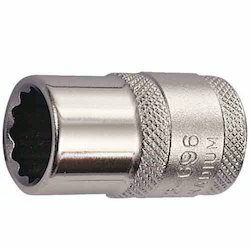 Impact Sockets 12-point, for additional torque grip. Spark-resistant tools are used to eliminate the chances of accidental fires or explosions in potentially combustible or explosive environments. They resist the sparks that a standard tool could potentially create when striking hard surfaces. The use of spark resistant tools is essential in many industrial applications such as petroleum and chemical manufacturing, spray booth operations, the marine industry, the mining industry, the paper industries, or any location where flammable vapours or combustible residues are present. Aluminium-bronze spark resistant safety tools are manufactured to 25HRC and offer a breaking strain of 75 - 85kgf/mm2. Spark-resistant tools must be maintained with special care. Frequent cleaning/re-dressing to remove ferrous particles or contaminants, which may impair the spark-resistant properties, is essential. 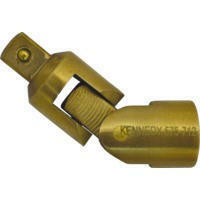 Universal Joint 1/2” Square Drive Hinged through 180° in both directions for operation at varying angles. Fitted with a spring-loaded ball bearing socket retainer. Spark-resistant tools are used to eliminate the chances of accidental fires or explosions in potentially combustible or explosive environments. They resist the sparks that a standard tool could potentially create when striking hard surfaces. The use of spark resistant tools is essential in many industrial applications such as petroleum and chemical manufacturing, spray booth operations, the marine industry, the mining industry, the paper industries, or any location where flammable vapours or combustible residues are present. Aluminium-bronze spark resistant safety tools are manufactured to 25HRC and offer a breaking strain of 75 - 85kgf/mm2. Spark-resistant tools must be maintained with special care. Frequent cleaning/re-dressing to remove ferrous particles or contaminants, which may impair the spark-resistant properties, is essential. 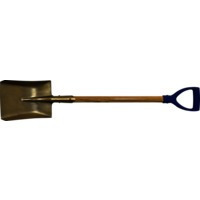 Square Shovel Spark resistant shovel with square mouth, polypropylene ‘YD’ handle and wooden shaft. 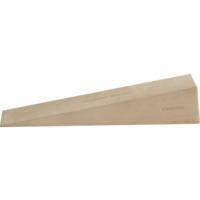 Blade size: 235 x 185mm. Overall length: 950mm. Spark-resistant tools are used to eliminate the chances of accidental fires or explosions in potentially combustible or explosive environments. They resist the sparks that a standard tool could potentially create when striking hard surfaces. The use of spark resistant tools is essential in many industrial applications such as petroleum and chemical manufacturing, spray booth operations, the marine industry, the mining industry, the paper industries, or any location where flammable vapours or combustible residues are present. Aluminium-bronze spark resistant safety tools are manufactured to 25HRC and offer a breaking strain of 75 - 85kgf/mm2. Spark-resistant tools must be maintained with special care. Frequent cleaning/re-dressing to remove ferrous particles or contaminants, which may impair the spark-resistant properties, is essential. 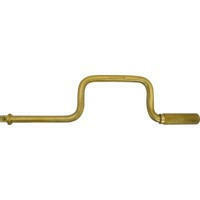 Wrecking Bar For general dismantling and stripping applications. V-notch for use on nails. Spark-resistant tools are used to eliminate the chances of accidental fires or explosions in potentially combustible or explosive environments. They resist the sparks that a standard tool could potentially create when striking hard surfaces. The use of spark resistant tools is essential in many industrial applications such as petroleum and chemical manufacturing, spray booth operations, the marine industry, the mining industry, the paper industries, or any location where flammable vapours or combustible residues are present. Aluminium-bronze spark resistant safety tools are manufactured to 25HRC and offer a breaking strain of 75 - 85kgf/mm2. Spark-resistant tools must be maintained with special care. Frequent cleaning/re-dressing to remove ferrous particles or contaminants, which may impair the spark-resistant properties, is essential. 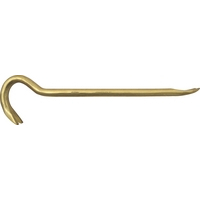 Drift Punch Tapered punch, used for the purpose of aligning holes between two structural members so that they can be fastened or bolted together. 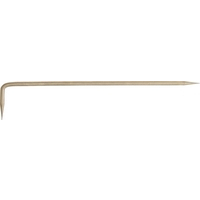 Overall length: 160mm. Tip size: 3mm. Spark-resistant tools are used to eliminate the chances of accidental fires or explosions in potentially combustible or explosive environments. They resist the sparks that a standard tool could potentially create when striking hard surfaces. The use of spark resistant tools is essential in many industrial applications such as petroleum and chemical manufacturing, spray booth operations, the marine industry, the mining industry, the paper industries, or any location where flammable vapours or combustible residues are present. Aluminium-bronze spark resistant safety tools are manufactured to 25HRC and offer a breaking strain of 75 - 85kgf/mm2. Spark-resistant tools must be maintained with special care. Frequent cleaning/re-dressing to remove ferrous particles or contaminants, which may impair the spark-resistant properties, is essential. 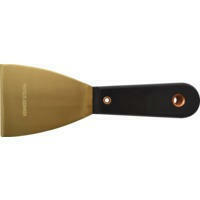 Putty Knife Spark resistant putty knife with a chisel point. Blade length: 100mm (4”), Overall length: 200mm (8”). Spark-resistant tools are used to eliminate the chances of accidental fires or explosions in potentially combustible or explosive environments. They resist the sparks that a standard tool could potentially create when striking hard surfaces. The use of spark resistant tools is essential in many industrial applications such as petroleum and chemical manufacturing, spray booth operations, the marine industry, the mining industry, the paper industries, or any location where flammable vapours or combustible residues are present. Aluminium-bronze spark resistant safety tools are manufactured to 25HRC and offer a breaking strain of 75 - 85kgf/mm2. Spark-resistant tools must be maintained with special care. Frequent cleaning/re-dressing to remove ferrous particles or contaminants, which may impair the spark-resistant properties, is essential. 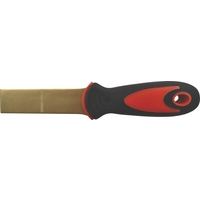 Scraper Blade length: 95mm (33/4”). Blade width: 75mm (3”). Overall length: 200mm (8”). Spark-resistant tools are used to eliminate the chances of accidental fires or explosions in potentially combustible or explosive environments. They resist the sparks that a standard tool could potentially create when striking hard surfaces. The use of spark resistant tools is essential in many industrial applications such as petroleum and chemical manufacturing, spray booth operations, the marine industry, the mining industry, the paper industries, or any location where flammable vapours or combustible residues are present. Aluminium-bronze spark resistant safety tools are manufactured to 25HRC and offer a breaking strain of 75 - 85kgf/mm2. Spark-resistant tools must be maintained with special care. Frequent cleaning/re-dressing to remove ferrous particles or contaminants, which may impair the spark-resistant properties, is essential. 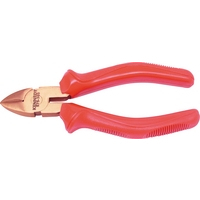 Wedges Spark-resistant tools are used to eliminate the chances of accidental fires or explosions in potentially combustible or explosive environments. They resist the sparks that a standard tool could potentially create when striking hard surfaces. The use of spark resistant tools is essential in many industrial applications such as petroleum and chemical manufacturing, spray booth operations, the marine industry, the mining industry, the paper industries, or any location where flammable vapours or combustible residues are present. Aluminium-bronze spark resistant safety tools are manufactured to 25HRC and offer a breaking strain of 75 - 85kgf/mm2. Spark-resistant tools must be maintained with special care. Frequent cleaning/re-dressing to remove ferrous particles or contaminants, which may impair the spark-resistant properties, is essential. 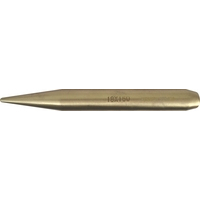 Marking Tool Double-ended spark resistant marking tool. Overall length: 190mm. Spark-resistant tools are used to eliminate the chances of accidental fires or explosions in potentially combustible or explosive environments. They resist the sparks that a standard tool could potentially create when striking hard surfaces. The use of spark resistant tools is essential in many industrial applications such as petroleum and chemical manufacturing, spray booth operations, the marine industry, the mining industry, the paper industries, or any location where flammable vapours or combustible residues are present. Aluminium-bronze spark resistant safety tools are manufactured to 25HRC and offer a breaking strain of 75 - 85kgf/mm2. Spark-resistant tools must be maintained with special care. Frequent cleaning/re-dressing to remove ferrous particles or contaminants, which may impair the spark-resistant properties, is essential. 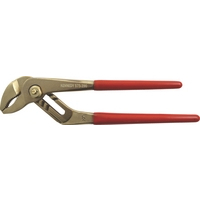 Groove Joint Pliers Serrated jaws with sliding pivot joint which allows a wide range of jaw opening. Spark-resistant tools are used to eliminate the chances of accidental fires or explosions in potentially combustible or explosive environments. They resist the sparks that a standard tool could potentially create when striking hard surfaces. The use of spark resistant tools is essential in many industrial applications such as petroleum and chemical manufacturing, spray booth operations, the marine industry, the mining industry, the paper industries, or any location where flammable vapours or combustible residues are present. Aluminium-bronze spark resistant safety tools are manufactured to 25HRC and offer a breaking strain of 75 - 85kgf/mm2. Spark-resistant tools must be maintained with special care. Frequent cleaning/re-dressing to remove ferrous particles or contaminants, which may impair the spark-resistant properties, is essential. 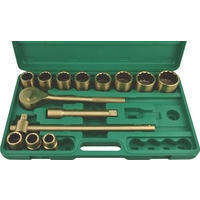 Socket Set 1/2” Square Drive Sockets: 10, 11, 12, 14, 17, 19, 22, 24, 27, 30 and 32mm. 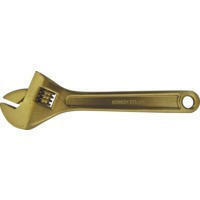 Accessories: 250mm ratchet wrench, 250mm sliding T-handle, 400mm speed brace, 125 and 250mm socket extensions. Spark-resistant tools are used to eliminate the chances of accidental fires or explosions in potentially combustible or explosive environments. They resist the sparks that a standard tool could potentially create when striking hard surfaces. The use of spark resistant tools is essential in many industrial applications such as petroleum and chemical manufacturing, spray booth operations, the marine industry, the mining industry, the paper industries, or any location where flammable vapours or combustible residues are present. Aluminium-bronze spark resistant safety tools are manufactured to 25HRC and offer a breaking strain of 75 - 85kgf/mm2. Spark-resistant tools must be maintained with special care. Frequent cleaning/re-dressing to remove ferrous particles or contaminants, which may impair the spark-resistant properties, is essential. Socket Set 3/4” Square Drive Sockets: 21, 24, 27, 30, 32, 34, 36, 38, 41, 46 and 50mm. 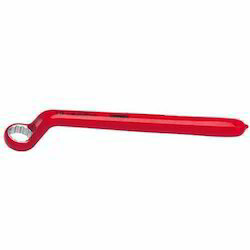 Accessories: 320mm ratchet wrench, 400mm sliding T-handle, 200mm socket extension. Spark-resistant tools are used to eliminate the chances of accidental fires or explosions in potentially combustible or explosive environments. They resist the sparks that a standard tool could potentially create when striking hard surfaces. The use of spark resistant tools is essential in many industrial applications such as petroleum and chemical manufacturing, spray booth operations, the marine industry, the mining industry, the paper industries, or any location where flammable vapours or combustible residues are present. Aluminium-bronze spark resistant safety tools are manufactured to 25HRC and offer a breaking strain of 75 - 85kgf/mm2. Spark-resistant tools must be maintained with special care. Frequent cleaning/re-dressing to remove ferrous particles or contaminants, which may impair the spark-resistant properties, is essential. 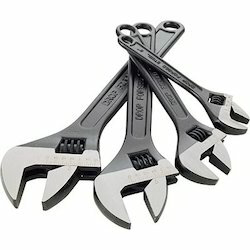 Looking for Non Sparking Tools ?